For the past few weeks, I’ve been trying to make a good blueberry smoothie. It’s surprisingly not so easy as it sounds. Blueberries are such a tiny fruit and they come in such tiny containers, that it’s really hard to get enough substance to make a smoothie out of them. Either I don’t put enough in, and there’s just not enough fruit to get the smoothie to right consistency. So I end up adding more of other fruits to compensate, such as bananas. But then I end up with a really good smoothie that doesn’t taste at all like blueberries, since the other fruits overcompensate. Or, I end up having to throw in a full container or two of blueberries. They’re not exactly cheap, and I don’t necessarily want to use all my blueberries in one single smoothie recipe. The thing about blueberries is that they are such a yummy fruit, and loaded with antioxidants, especially impressive considering their tiny size. So they’re an ideal fruit for smoothies, to take advantage of the health benefits of blueberries. But because of their tiny size, it’s really hard to make a smoothie out of them that actually has a blueberry flavor. Finally, after much trial and error, I found a solution! Have you been craving a blueberry smoothie, but had similar problems in the past with getting the right texture? Start by peeling the bananas, break into chunks and add to blender. I like this ratio of ¼ cup fresh to ¾ cup frozen, because I still get the benefits of fresh blueberries in terms of taste and nutrition, without having to use up too many of the fresh blueberries (and without spending a fortune). I still get some fresh blueberries when they’re in season, which are definitely tastier and better for you. But I balance it out with a good amount of frozen blueberries, which are cheaper, more intense flavor, available year round, and come in large quantities. It’s a nice compromise that works. At this point, if you are using a regular blender (not a high-powered blender such as Vita Mix), go ahead and add the water and start blending. You’ll turn it into a nice liquid while it’s still easy to blend, leaving room for the greens and the ice. *For the greens, I used 3 cups green lettuce. 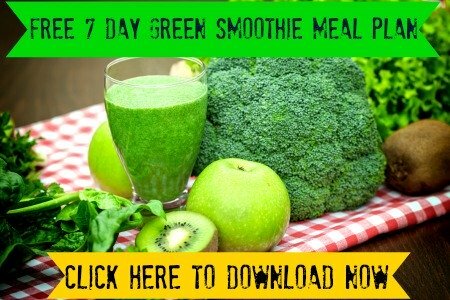 Use 1 or 2 cups if you’re just getting started with green smoothies. I’m working on gradually increasing my greens ration in my green smoothies to get more nutrition benefits. You can also use spinach, kale, romaine lettuce, etc. See green smoothies for more ideas. Then add the ice and blend again. If you’re using a low-powered blender, you might even want to do 3 blending cycles: after the fruit and water, after the greens, and after the ice. Add a sweetener if desired before your final blending cycle. It doesn’t need it, as the fruits provide plenty of natural sweetness, but sometimes it doesn’t hurt to add a little extra sweet touch. Makes 4 ½ cups of blueberry smoothie! If you’re a single person, making this smoothie for yourself, 4 ½ cups might seem like a lot. That’s especially the case if you’re used to the smoothies from places like Jamba Juice, Smoothie King, and other smoothie stores. Those smoothies come in 16 oz and 32 oz…and they’re loaded with sugar. That’s because they have ingredients such as sherbet and fruit juice from concentrate. So if you had 4 ½ cups, or 36 oz, of that kind of smoothie, that you buy in a store, it would not be so good for you. fresh fruit, greens, water, ice and a tiny bit of plant-based sweetener. It has tons of antioxidants and other ingredients crucial for the body to work properly and heal itself. So with this kind of smoothie, the more the merrier. If 4 ½ cups seems like too much to drink all in one sitting, that’s understandable. pour half of the smoothie into a tall glass to drink immediately, and the rest into a tall portable coffee mug to drink for later. I do this almost every single day. I drink the first 16 oz of fruit shake first thing in the morning, to get my body going with a burst of nutrients and energy. Then I carry the rest with me to work, and drink it throughout the morning as a little snack or even sometimes in the afternoon to get me over the 2 pm energy slump. Just make sure that you cover the smoothie that you don’t plan to drink immediately, so it will stay fresh. If you don’t have a tall mug with a lid, use any tall glass and just put a little bit of aluminum foil on top and wrap it around the glass as a makeshift lid. Click here to ask a question about this blueberry smoothie recipe. Summer Apricot Smoothie – Also has green lettuce…and equally tasty. Cherry Smoothie Recipe – I cannot emphasize enough how amazingly delicious this smoothie is. Questions About This Blueberry Smoothie Recipe? Do you have any questions about how to make this blueberry smoothie recipe? Or about making smoothies in general?